Perhaps you remember previous posts about the quilling of Licia Politis, a friend I met via The North American Quilling Guild. Her creations, such as an outstanding Australian-themed chess board and If the Shoe Fits, Wear It, have won many awards. Licia's latest art piece is a whimsical, full-size tea set, inspired by the movie Alice in Wonderland and the Mad Hatter’s Tea Party. I'm happy to have seen it in person at the NAQG 2010 convention this past spring, where it won a First Place and the People's Choice award. It also took a First at the 2010 Sydney Royal Easter Show, was exhibited in the Showcase of Excellence, and was awarded the Rose Bowl at last month's meeting of the UK Quilling Guild. "It's a Celebration" required over twelve hundred 12 inch (30 cm) strips of white quilling paper, one thousand strips of pink and green, five hundred strips of yellow, and took three months to complete. The colorful, three dimensional sculptures are created entirely from paper and glue, and are great examples of specialty edging techniques. 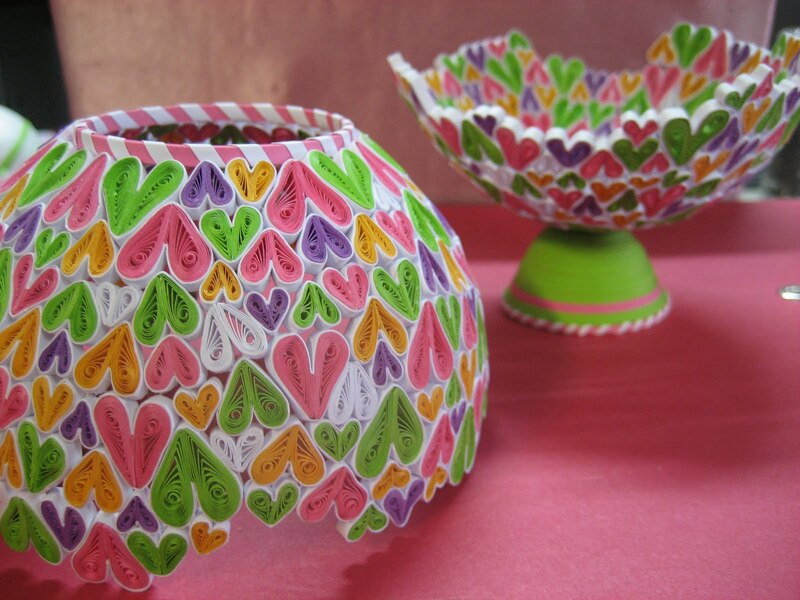 Licia says, "When quilling the teacup, I was inspired by Dutch paper artist Siba Sahabi. Quilled heart shapes seemed the appropriate form to tessellate around a polystyrene ball to create the circular shape of the teapot, as well as to follow the theme of the Mad Hatter’s Tea Party." 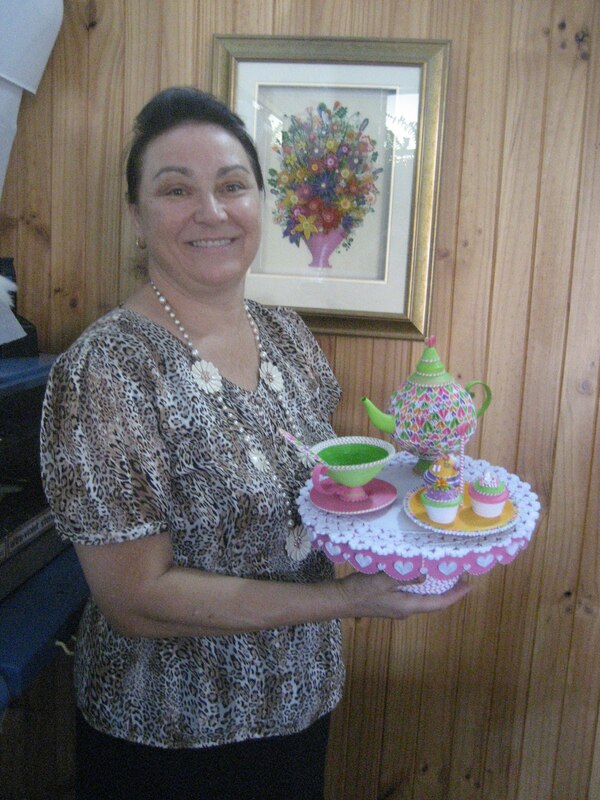 The quilled white doily contrasts nicely with the bright colors of the plate, cupcakes, teapot, and cup. I also like the way the crimped hearts create a star pattern when arranged in a circular pattern. The New South Wales Royal Agricultural Society (RAS) has asked Licia if they may acquire this piece for their archival section for historical purposes. She is contemplating donating the piece so that the RAS will have a piece of quilling in their collection. Another delightful tea set is this miniature version created by talented quiller and blogger, Inna Dorman. Many of you are familiar with Inna's terrific work, and as soon as I saw her post on Friday, I knew the two tea sets would make a great pair. See how versatile narrow strips of paper can be? It's entirely possible to quill as large or small as you like! Truly, truly amazing work....I see what you mean by the edging techniques. Amazing what you can do with paper and glue. Amazing work, The heart shapes she has used to make these three dimensional objects is extraordinary ,Every work of Inna's is beautiful. Impressive! The colors are so vivid and the miniatures make me want to see everything up close. These two artists truly complement each other. Terrific post. Such details to work. So talented! Such women are my true inspiration. I would love to learn more and more!! OMG OMG unbelievable,amazing. So much detailing n patience. Such incredible work! The colors and intricacy really make this amazing! Wow, this is amazing. Unfortunately I would be too impatient for anything like that, but I can appreciate the work that went into it. Art! Ann thanks so much for sharing all these wonderful artists with us. I enjoy then so much. This is a simply amazing tee set! I am certainly a 3D quiller, and I am at least intermediate...but none of my work could compare to this! I have made something that took me 2 months to make...but I did that on and off. As I am still young, I know I'll eventually make something as ah-mazing as this is! Totally inspiring. Wow, what an amazing creations! All her time really paid off. Thanks for sharing this with us. OH MY GOODNESS!! I feel quite embarassed you've looked at my feeble attempt at quilling, you blog is amazing, the tea pot is amazing, only seen your first few posts and in orr !! Thankyou for taking the trouble to look at my blog. Thanks for your great comments, everyone. Hi Enjay, absolutely no need for embarrassment - your little bride and groom are wonderfully quilled. My comment was most sincere! I'm glad you're enjoying the blog. I thank Ann for featuring my piece 'It's a Celebration' and everyone who took the time to comment about the quilled teasets. My taeset was a fun whimsy piece to quill and I hope it might bring a smile to the viewers. 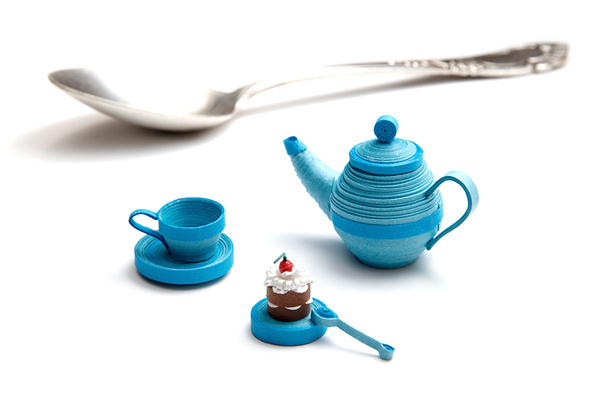 Congrats to Inna for her cutest tiny teaset...it is just delightful! I am sure 'anonymous' one day will quill a 3d piece just as good , if not even better!! Maravilhoso seu trabalho!!! Fiquei encantada. Parabéns!!!! amazing; teapots is a lovely theme to work with and I was interested to read how the form-shape came about with polystyrene ball. Guess it had to be cut out on completion? That would be a tricky job....would love to know more of that process.